Running artificial intelligence algorithms on data collected from medical records and wearable devices can aid diagnosis and find unexpected ailments. Making sense of the vast amount of data stored in our medical records and coming from the growing number of medical devices we use at home or in the hospital is a hot area for technological advances. Running artificial intelligence algorithms on health data collected via HMOs, wearable devices or hospitals can aid with diagnoses, suggest unexpected ailments and prevent fatal complications. Israel has a cluster of startups doing exactly that. ISRAEL21c looks at 10 of the most promising. Jerusalem-based startup MonitHer doesn’t have a website yet, but we suspect it won’t be long: The company, founded by American immigrant to Israel Yehudit Abrams, won the $360,000 grand prize at the WeWork Creator Awards in Jerusalem in June 2018. MonitHer is developing an ultrasound device that can be used by women at home to monitor for abnormalities in breast tissue. Women using the device will scan their breasts once a month for about 10 minutes. Software then monitors the images, looking for any changes over time. The images are also uploaded to MonitHer’s servers. Once MonitHer has more than 100,000 users, artificial intelligence and machine learning will be able to compare tissue images in a woman’s offline MonitHer medical record with those in the cloud. The result: increased chances of early detection compared with monthly self-exams and more frequent scans than an annual mammogram at a much lower cost. “We are changing the paradigm from breast cancer screening to breast health monitoring,” Abrams says. A patient is admitted to the emergency room with a head injury. The care team will send the patient for a head CT to assess the possibility of a stroke or intracranial hemorrhage. That scan will become part of the patient’s permanent medical record. But meanwhile, doctors need to act fast because for every minute that passes, brain cells die. That’s one reason why Tel Aviv-based MaxQ AI (formerly known as MedyMatch) was granted an “Expedited Access Pathway and Breakthrough Device” designation by the US FDA earlier this year. The company’s artificial intelligence-based Accipio software platform uses deep-learning technologies to alert physicians automatically of a potential brain bleed. MaxQ AI has already signed agreements with IBM Watson, GE Healthcare and Samsung Electronics. Accipio received FDA clearance in November 2018. 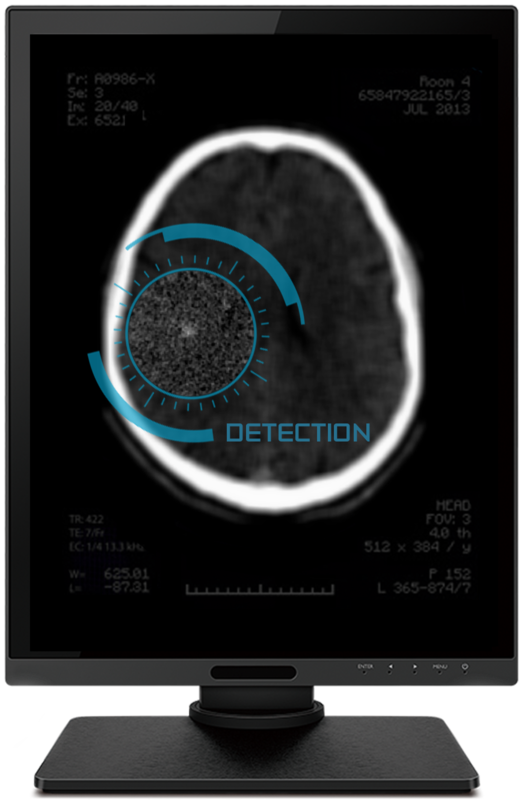 Aidoc takes what MaxQ AI does for head injuries and applies it to CT scans of all kinds. The company’s software uses artificial intelligence to help radiologists catch serious issues in real time. 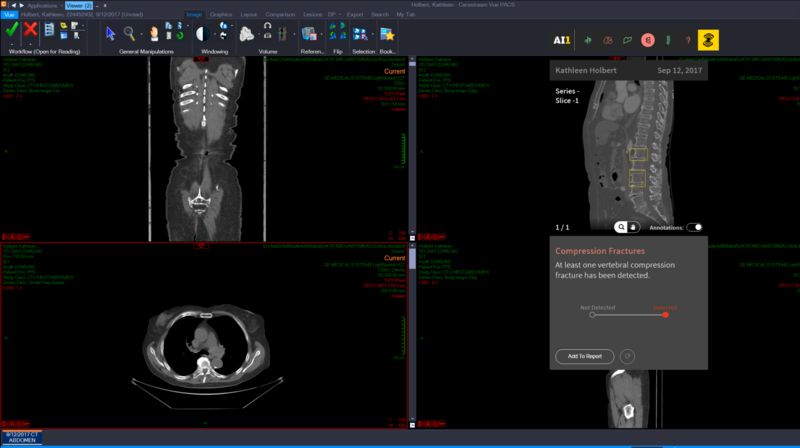 By comparing a fresh scan with the 300,000 patient images that have already been analyzed, Aidoc’s “always-on AI” displays an alert on the radiologist’s computer screen immediately if an abnormality is detected. “The radiologist doesn’t have to click anything for this to happen,” the company’s CEO Eyal Walach told ISRAEL21c. That led TIME magazine to place the two-year-old company on its list of “50 genius companies of 2018” and has helped the company raise $13 million. Aidoc says it has saved radiologists some 50,000 hours of work and flagged 140,000 abnormalities. X-rays and MRI analysis will be added in 2019. The company has already received US and European approval to assess scans of brain hemorrhages and spinal fractures. If you are connected to a ventilator in the hospital ICU, your chance of contracting ventilator associated pneumonia (VAP) is 25 percent. VAP develops because, along with the ventilator, a patient must be hooked up to a feeding tube where gastric content from the stomach can flow into the lungs due to reflux and aspiration. Ten percent of patients with VAP never recover. 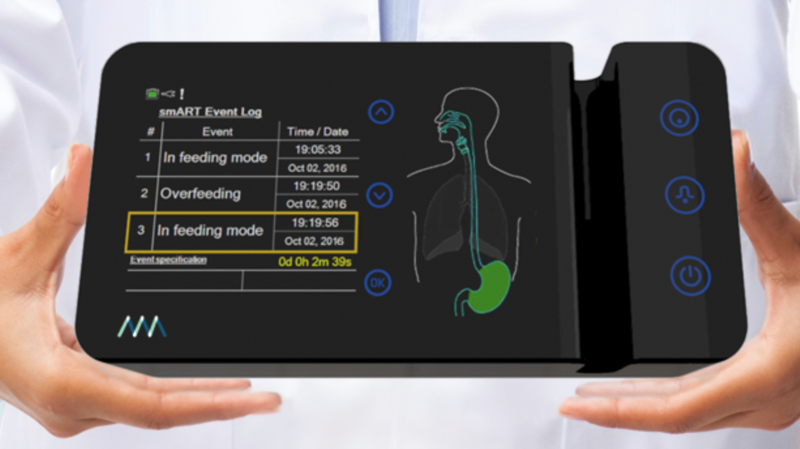 ART Medical has developed smart feeding tubes laden with sensors that automatically collect patient data including reflux rates, food requirements, saliva and urine output to adjust the nutritional doses delivered through the tube. The eight-year-old company has raised $29 million to develop its Anti-Reflux Tube (that’s where the “ART” comes from). The company’s algorithms also automate the placement of feeding tubes in the stomach – a process that currently must be done through X-ray imaging – as well as provide real-time monitoring to assure the tubes stay in place. ART Medical has been collaborating over the past year with hospitals in Israel and the United States. Two years ago, Gal Salomon’s mother developed sepsis during a stay in the hospital and died. “It was a big hospital with a lot of patients and no one saw or understood it was happening,” Salomon recalls. Salomon now heads Clew Medical, which develops software that uses artificial intelligence to predict which patients in a hospital’s ICU are at the highest risk of imminent deterioration, and alerts staff so they can intervene early. Clew’s software connects to the ICU’s systems – for example, those that track blood pressure and heart rate – and pairs it with data from a patient’s electronic medical record as well as data in the cloud that Clew has collected on patients with similar conditions. Clew can predict how long a patient will need to be connected to a ventilator or a dialysis machine, and when a patient will be ready for discharge. The company is testing its software at Sheba and Ichilov hospitals in Israel, and the Mayo and Cleveland clinics in the United States. Clew has raised $30 million since it was founded in 2014. If you’ve ever had a biopsy taken to check for cancer or a gastrointestinal disease, you know that waiting for results – which can take anywhere from a few days to a month – can be nerve-racking. Disease diagnosis is performed by pathologists who must examine the tissues and cells taken from the biopsy manually under a microscope. Avi Veidman, a veteran of an Israeli intelligence unit specializing in computer vision, wondered if the kind of software his team had developed for decoding aerial and satellite images could work for detecting patterns on a cellular level. He started Nucleai with two other veterans of the same IDF unit in 2017 to make the painstaking work of pathologists faster and more accurate and, as a result, reduce patients’ wait times. Nucleai’s software also factors in information drawn from patients’ medical records and their genomics data. The company has raised $5 million and is working on a prototype with a pilot expected to launch in the coming months. Medial’s algorithms analyze the data in a patient’s electronic health record to identify those at high risk for specific medical conditions. There’s no need to connect Medial’s software to an ICU system or a CT machine. Medial’s first product in the US, LGI Flag, uses its AlgoAnalyzer operating system to identify patients who might develop lower GI disorders by looking at their blood-test results, age and gender; it’s now being used in Israel by the Maccabi HMO. Of 80,000 patients evaluated in 2017, 690 were marked as high risk, with 20 cases of cancer confirmed. Medial is also applying its predictive models to flagging pre-diabetic patients at high risk of progressing to diabetes. High-risk individuals are only 5% of the total patient population but account for 50% of healthcare costs. Medial is conducting clinical data studies in 14 sites in the US, Israel, Europe and Asia, comprising some 20 million patients. MilagroAI does for hospital records what Medial EarlySign does for patients’ individual electronic health records. Combining deep-learning algorithms and text analysis, Milagro can parse the 70% of medical information that’s locked in unstructured data sources such as hospital documents and summaries of surgical and radiological procedures. Milagro says its technology turns “all the relevant trapped and noisy data into simple, clear and actionable real-time information about a patient.” Medical staffers receive relevant alerts and the company’s software identifies patients at the highest risk for hospital-acquired infections. The straw that broke the camel’s back for Dr. Gidi Stein was when he encountered the case of a nine-year-old boy who was incorrectly prescribed an anti-coagulant instead of an asthma medicine. The boy fell off his bike and subsequently died as a result of a cerebral hemorrhage. As Stein, who specializes in internal medicine, dug deeper, he discovered other cases: insulin prescribed to a patient without diabetes, chemotherapy given to a 28-year-old healthy male. Stein cofounded MedAware in response. Using AI is key: other decision-support systems only alert physicians based on pre-programmed rules. During testing with 400,000 patients, MedAware turned up 6,000 incorrect prescriptions, “some of which were life threatening,” says Stein. 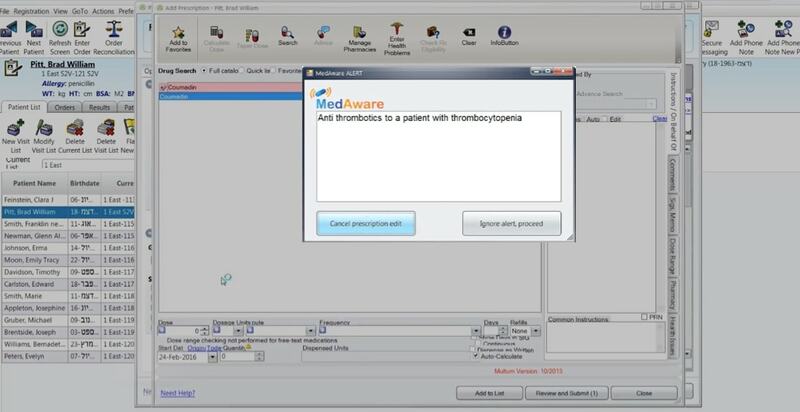 MedAware, which has an accuracy of up to 80%, is installed at sites in the US and Israel, including Sheba Medical Center. The company, founded in 2012, has raised $12 million. Making sense of radiology is becoming an Israeli specialty. Zebra Medical Vision, the most veteran firm on the imaging block, was founded in 2014 and is headquartered on a kibbutz. Its software parses patterns in medical images to identify diseases a radiologist might miss. Zebra’s chest x-ray analytics product was “trained” using 2 million images to help identify 40 common conditions. Zebra charges its hospital clients $1 per image scanned – less than a medical center would have to pay a radiologist for the time spent. And the company’s structured clinical dataset of millions of images is available for researchers to use. In November 2018, the company received FDA clearance for a coronary calcium scoring algorithm, critical in identifying heart disease. Zebra already has European CE approval for an additional seven algorithms. In June 2018, the company raised $30 million, bringing its total investment to $50 million.